I don't know who first suggested that President Obama utilize the presumed authority of the 14th amendment to by-pass the need of congressional approval to raise the debt ceiling; however, it's former President Bill Clinton's endorsement of such a move that has stirred liberals and progressives to speak out in blogs and intense Facebook discussions in favor of the President "using" the 14th amendment. It sounds so simple. I've been practicing law for 14 years; I studied constitutional law and I'm not nearly as convinced as many of my non-lawyer friends that using the 14th amendment is possible. Frankly, it drives me nuts when people chime in about the application of constitutional provisions with little or no understanding of the background or context. It's about as valid as my coaching a major league baseball team; I like baseball but I don't know enough about the game to coach anyone. Yeah, I know, some of you feel insulted; however, that's not my primary intent. Just be happy that I'm not sharing my disgust with Nancy Grace and the public outcry following the Casey Anthony verdict. Instead, I'm providing a brief primer on this whole 14th amendment business. The 14th amendment has never been applied in this context by any president so there is no precedent and no jurisprudence analyzing what specific authority Section 4 of the XIV amendment confers on the president with regards to the public debt. Construction, i.e. the interpretation of constitutional provisions can be somewhat difficult when the language of the provision is ambiguous or unclear. Ambiguity opens the door for interpretation by the court and raises the issue of strict construction versus broad construction. Strict construction means interpreting the Constitution based on a literal and narrow definition of the language without reference to the differences in conditions when the Constitution was written and modern conditions, inventions, and societal changes. In contrast "broad construction" looks to what someone thinks was the "intent" of the framers' language and expands and interprets the language extensively to meet current standards of human conduct and complexity of society. Justices Scalia and Thomas are known as being strict constructionist, insisting on interpreting the Constitution in terms of how the provision was applied at its inception and in is historical context. Unfortunately, most people and the media quote only the first sentence. A big boo-boo in interpreting any law, including the Constitution, is divesting a provision from its surrounding language instead of analyzing the provision in its totality. The 14th amendment was added post Civil War or as some southerners prefer, the War of Northern Aggression. The intent at the time was to declare that the US was not going to pay any debts incurred by the Confederacy, which had borrowed money from England and France to help in its secession efforts. So Section 4 confirmed that all U.S. public debt authorized by Congress was legitimate and declared that neither the U.S. nor any state would be responsible for paying any debts incurred by the Confederacy for the war or the loss of slaves. The Confederacy considered slaves to be property and made some noises about reimbursement for the loss of their property. The 14th amendment is also the source of the Citizenship Clause, the Equal Protection Clause, and the Due Process Clause. Arguably, those clauses were intended to be substantively more important than the Public Debt Clause. Narrowly construed, it may be argued that the Public Debt provisions were only to clarify that the United States was not going to be financially responsible for the debts incurred by the Confederacy and was not intended to confer power on the President to determine the amount of the public debt for which the federal government would be held responsible. A broader construction could certainly find that the language confers authorization on the President to increase the debt limit without congress' approval. However, given the conservative nature of the current court and the number of 5 to 4 decisions that have been issued by the court, decisions that reflect strict construction and narrow interpretations of the law, it certainly is not a given that the President could simply invoke the alleged authority of the 14th amendment and increase the debt limit. Bill Clinton is a lot more certain than some other constitutional scholars in his belief that the 14th amendment allows Obama to raise the debt ceiling without congressional approval. It may be possible but there is certainly the risk that doing so will provide the Republcans with the excuse to begin impeachment proceedings. Clinton managed to survive his impeachment relatively unscathed but I don't know if Obama has as much teflon coating as Bill Clinton and the charges may stick. Even if there is no impeachment effort, there will likely be a challenge in the courts as to the president's authority to act under the 14th amendment. Given the current conservatives on the court, it would likely be an uphill battle for the President and he could fare like Sisyphus and find himself unable to push his rock all the way uphill. What I am challenging are those who shout for the President to just use the 14th amendment as if it is a given that such an action is prudent and will be successful. Our government has always been about compromise. When this country could not find a point of compromise on the issue of the expansion of slavery in a growing country, we engaged in a civil war that devasted the entire country and resulted in a major lose of life on both sides. Compromise is not a four-letter word and I shudder to think of the possible alternative. 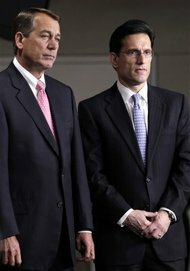 Imagine if Speaker of the House John Boehner received millions of emails and phone calls telling him that we're mad as hell and demand that he and the Republican party cease and desist from its efforts to sacrifice our children, the elderly, low wealth, and working class families on the altar of tax cuts for those most capable of paying taxes. Stop imagining and contact Boehner's office, (202) 225-0600, shut down his phone lines, and give McConnell a call too, (202) 224-2541. If you can't reach Boehner's office by phone, send him an email. You don't have to be in Boehner's Ohio district, you may contact him in his capacity as Speaker of the House using this link. Below is my email to Boehner that I sent today. I've voted in every election since I became eligible to vote, that's over 35 years ago. Members of the U.S. Congress do not represent only their districts but the well being of the entire country. As Speaker of the House, you are responsible to all of us; the people are the government. I am dismayed at the continual efforts of your party to support tax breaks for the wealthiest 2% in this country. I am insulted that your party continues to try and persuade the voters that this is in their best interests. The theory of trickle-down economics has not worked in spite of efforts to insist that it will benefit the people of this country. The haves continue to gain more and the have-nots continue to have less. This policy has not been shown to create more jobs. Our country is in debt and the revenues from letting the tax breaks for the wealthy expire would add considerable monies to our coffers. The justifications offered for not allowing the tax breaks to expire are ludicrous. The loopholes that allow major corporations to avoid paying taxes are ludicrous. Your party's refusal to listen to the will of the people is ludicrous. Your party's position is that we have a spending problem and not a revenue problem. This is beyond ludicrous. We have a deficit problem. When your expenditures exceed your revenues, it is certainly appropriate to make cuts where possible but it is also prudent to engage in methods to secure additional revenues. To put it simply, if my expenditures exceed my budget, I cut back on spending. However, I don't also refuse to take steps to increase my income. I can't say that I will no longer vote for your party; I never have and most likely never will. I will say that the destruction that you sow if you continue with this shortsighted policy will affect generations to come, and you and your party will earn the dubious distinction of having sunk the American economy. Speaker Boehner, work with the President, not against him. It's time to tell these elected officials that we're mad as hell and we're not going to take it any more. Give the President your support. He cannot stop the Republicans simply because he says so. He's the President, not a dictator. To those of you still insisting that he caved on the extension of the tax rates, get off that ride. He did not have the votes to end the tax breaks for the wealthy. If he had vetoed the bill that extended those cuts, his veto would have been overridden. Yes the Democrats were in control but all Democrats were not loyal. Instead of taking a symbolic stand that would have resulted in failure any way, the President used it as an opportunity to ensure the continuation of elements of the tax code such as the earned income tax credit (EITC) that directly benefit low wealth families. If you want to do something now, if you want to fight the good fight, then make Congress hear that we will not accept the extension of the tax cuts for the wealthy. Making a few phone calls and/or writing an email will take you all of 15 to 20 minutes. Stop talking and start doing. I can't guarantee success but if we all do nothing, I can guarantee failure. Find and contact your senators. Find and contact your representatives.